There were some wonderful little snippets of information. For example, every man in Burma has to be a monk for a period of time, so every family has a connection to the monastery, and religion is closely woven into the fabric of society. Another little snippet was where the term ‘white elephant’ comes from. Apparently pale-coloured elephants were prized, but a ruler could cause frustration and embarrassment by giving someone a white elephant. The elephant would take great time and expense to care for, but the recipient could never get rid of it as it was a gift from the ruler. A belt with shells and coins. Wealth is worn rather than hidden away. 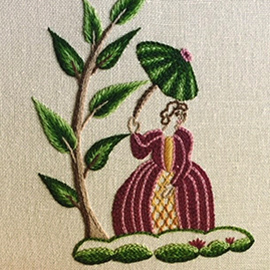 At our March meeting, members enjoyed a fantastic talk by Isobel Moore, who shared some of her wonderful machine-embroidered textile art with us. Her work (and her talk) were so well-liked that the forthcoming workshop on the 26th April booked up almost immediately. Don’t despair though, if you go on the waiting list then you may just squeeze in if there’s a cancellation. This is just to let you know that I shall be sitting with my loom and spinning wheel in Colonnade House between 8th – 12th May. The idea is that I shall have a happy week chatting to people and also letting anyone who wishes have a go ! Please pop in and see me if you get a chance! I know there are some good cafes nearby…..
Look what the Workshop Group made this month. Pam Bennett wrote: ‘Here is a photo of my finished zippy bag from our last workshop. Hope to make a couple more for Christmas presents. Thanks to Wendy for an excellent day’. It would be good to add more photos if anyone has them. P.S. I am trying to get my head round a different way of sending new posts to people who have subscribed via the link on the Home Page. If you receive spaghetti instead of something sensible, please let me know! At the February meeting, we were treated to an interesting talk by member Ruth Walker, who talked us through her ‘textile journey’. 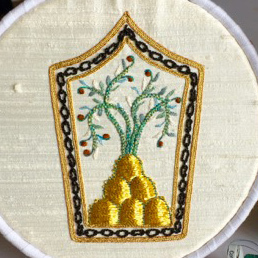 Ruth brought with her a beautiful collection of her work, including machine-embroidered bowls, pictures and bags. By her own confession Ruth has quite a ‘thing’ about bags, and they are such a good vehicle for displaying a range of techniques. 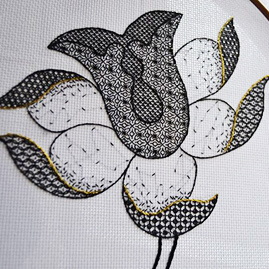 Ruth also showed us a wonderful range of designs based on peacocks. Some years ago she was treated to a magnificent display by a peacock who shook his tail-feathers at her and ‘strutted his stuff’, and peacocks have featured in her work ever since. Thanks to Ruth. We had a whole-day meeting this month, so there was plenty of time to ‘sit and sew’, and to see what people are working on. 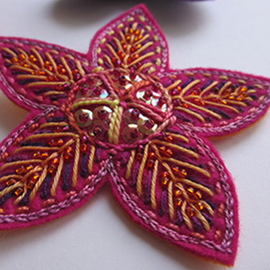 Jill showed people the results of a recent embellishing course she has been on, and demonstrated how she makes background fabrics using scraps and threads (don’t forget that the branch has an embellisher that you can rent for just £5 a month). And thanks for the encouraging feedback on the website everyone. Do keep sending in the photos – we are starting to build up a good range in the ‘gallery’. 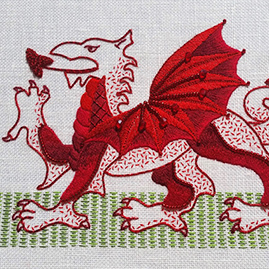 There are a few last-minute places available on day-school classes at the Royal School of Needlework in February and March – see below. 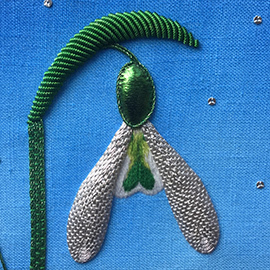 Is anyone else planning to take part in the Embroiderers Guild 100 Hearts project? The plan is for members to stitch hearts in commemoration of the 100th anniversary of the end of the First World War. The guild will exhibit them across the country in groups of 100, and I think they’ll be at Ally Pally too. I’m planning to make one, in memory of two great-uncles who died in the First World War, one on a troopship and one in the battlefield in Flanders. If anyone else from Worthing Tuesday is doing one, it would be good to photograph them together before they go off.